The holidays are over, and things are getting back to normal. In order to keep your household running smoothly, consider creating a schedule. This will help to keep everything on track. Already have a schedule? Be sure to assess it from time to time to determine what’s working, and what can be improved. What is a typical day for me? Do I tend to do things at a certain time each day? Next, block off time for: daily chores, weekly chores, and monthly chores. Don’t forget to schedule special projects like: putting away the Christmas decorations, birthday party planning, and doing your taxes. By using the Time Management Schedule, you’ll be sure to get all of the things done in your household. 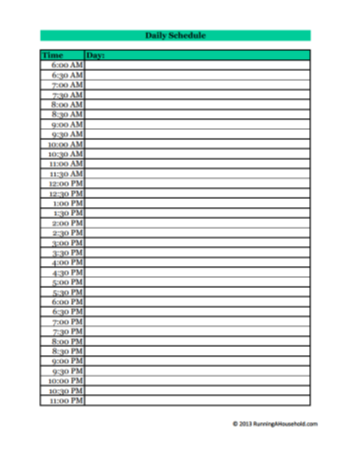 This entry was posted in Maintenance, Time Management and tagged free printable daily time schedule, free printable time management forms, Free printable time management schedule, printable daily schedule, printable half hour schedule, printable schedule by hour, printable time management charts, printable time management schedule, printable weekday schedule, printable weekend schedule, winter schedule planner on January 7, 2014 by Running A Household.